With the Series 11 of Doctor Who confirmed to air “by October”, the BBC has finally announced the full list of writers and directors that will be contributing to the series. And although none of the DWCA’s own candidates were selected, overall we’re pretty excited about what’s to come! Former Children’s Laureate Malorie Blackman has written over 60 books for children and young adults including the Noughts and Crosses series of novels and her book Pig-Heart Boy, which was adapted into a six-part TV series. She also wrote the Puffin eshort The Ripple Effect, a Seventh Doctor short story to celebrate the 50th anniversary of Doctor Who, which was republished in the 11 Doctors, 11 Stories collection, and its sequel 12 Doctors, 12 Stories. Playwright and screenwriter Vinay Patel’s television debut, Murdered By My Father, won the 2016 Royal Television Society Award for Best Single Drama and was nominated for three BAFTAs. He has also written an episode of The Good Karma Hospital, which featured new companion actor Mandip Gill for two episodes. Pete McTighe has written over a hundred hours of TV drama, including long-running Australian soap opera Neighbours, and been nominated for five Writers Guild Awards. He is also the originating writer of Wentworth, the female prison drama that has sold to over 150 countries. Joy Wilkinson has been selected as a Screen International Star of Tomorrow and has had two screenplays featured on the Brit List. Her TV scripts include the critically acclaimed BBC five-parter The Life and Adventures of Nick Nickleby, while her theatre work has won prizes including the Verity Bargate Award. Ed Hime was nominated for a Craft BAFTA for his first episode of Skins, and won the Prix Italia for his radio play The Incomplete Recorded Works of a Dead Body. They are of course joined by showrunner and head writer Chris Chibnall. Jamie Childs, who directed Jodie Whittaker’s reveal as the new Doctor, returns for the opening episode of the new series. He is currently directing two episodes of His Dark Materials, a miniseries based on Philip Pullman’s trilogy of fantasy novels. Australian director Jennifer Perrott wrote, directed, produced and executive produced 35mm short film The Ravens, and has directed programmes including Offspring and Home and Away. Since finishing Doctor Who she has been directing Gentleman Jack, a forthcoming BBC One/HBO historical drama series created by Sally Wainwright. Mark Tonderai has been making quite a name for himself, having directed Jennifer Lawrence thriller House at the End of the Street. He also directed all 10 episodes of miniseries The Five, as well as various episodes of Impulse, Lucifer, Gotham, Black Lightning, 12 Monkeys, George RR Martin’s Nightflyers and more. The team is capped off by Sallie Aprahamian, who has been directing television for over two decades with critically acclaimed shows including Extremely Dangerous, The Sins, Real Men, The Lakes, Teachers and This Life. “We have a team of writers who’ve been working quietly and secretly for a long time now, crafting characters, worlds and stories to excite and move you. 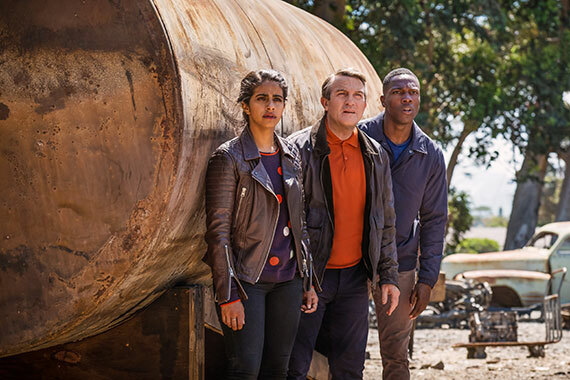 A set of directors who stood those scripts up on their feet, bringing those ideas, visuals and emotions into existence with bravura and fun,” said Chibnall.